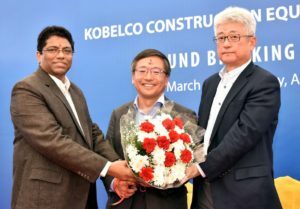 Sri City, March 20, 2018 :- In its pursuit to cash in on the emerging business opportunities in the country, Kobelco Construction Equipment India (KCEI) Private Limited, the Indian arm of the Japanese Kobelco Group, broke the ground for an additional plant in Sri City on Tuesday. In an auspices ceremony, marking the start of construction of the new facility, Mr. Ravindra Sannareddy, Founder Managing Director, Sri City along with Mr. Akira Kinoshita, Director & Sr. Managing Executive Officer, Kobelco Construction Machinery (KCM) and Mr. Tetsuo Yamamura, Deputy Director, Shimizu Corporation performed the groundbreaking ceremony in Japanese tradition. “I am optimistic that these expansions will further drive the economic growth in the region. Also, I am confident, this region, in line with AP CM’s vision, will soon grow as an automobile cluster, developing a symbiotic ecosystem benefiting the auto component makers.” he added. KCEI will investment Rs. 75 Crores for commissioning the new plant of 6500 sq. mtrs. area. It is expected to be ready within 12 months time. The highly automated plant will create direct job opportunity for 50 more people. When the new facility becomes operational, the annual production capacity of KCEI will be about 3000 of Hydraulic Excavators of capacity ranging from 14 t to 38 t. By maximising the advantages of local production in India, a market where further growth in demand is expected, KCEI seeks to capture a greater share of both domestic and overseas market demand. 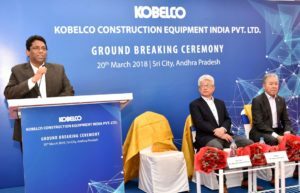 Mr. Vikram Sharma, Advisor, India & South Asia KCE, and former MD of Kobelco in India and a host of senior executives of Kobelco Group were present on the occasion. Kobelco Construction Machinery (KCM), the Tokyo headquartered company, founded in 1930, is a subsidiary of Kobe Steel Limited. The Indian arm KCEI, which completed 10 years of operations in India, is upbeat on the country’s construction equipment market with strong demand projected from roads and mining sectors. The Sri City plant was set up during January 2011. 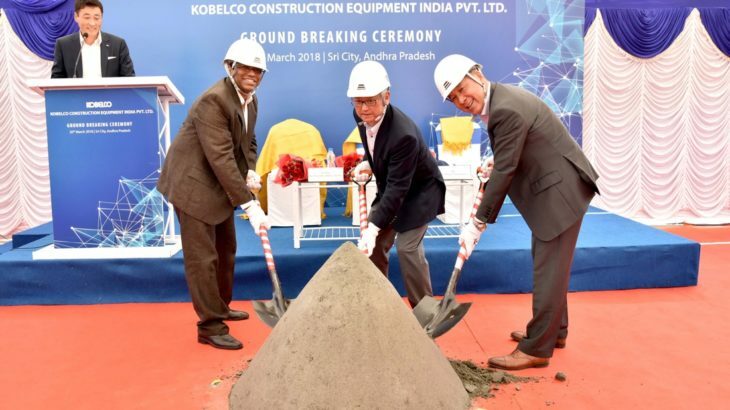 With the goal of streamlining the business and improving the production, sales, and service framework in India, KCM consolidated two subsidiaries viz., Kobelco Construction Equipment India Pvt. 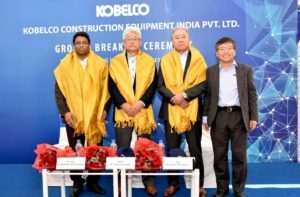 Ltd. (or KCEI) and Kobelco Cranes India Pvt. Ltd. (or KCI). The consolidated company oversees the manufacture and sales of hydraulic excavators and crawler cranes, as well as dealers in India. With KCEI as the surviving company, KCM aims to strengthen its production, sales and service framework in India.